While the offseason is not over, the Mets likely won’t be making any more big splashes. They’ve already stated that they won’t spend big in the outfield, meaning that they plan on relying on Jeff McNeil, Juan Lagares, and Keon Broxton to become a single competent 3rd outfielder. They already have a crowded infield so no more moves needed there. They’re also likely done in the relief market, with Justin Wilson, Jeurys Familia, Edwin Diaz, and Luis Avilan added to the bullpen. And while they will probably sign one more starting pitcher, it will likely be a depth signing rather than a big-name starter. This all means that the Mets plan on going into the 2019 season with mostly the current roster. So with that being said, let’s review the Mets offseason. 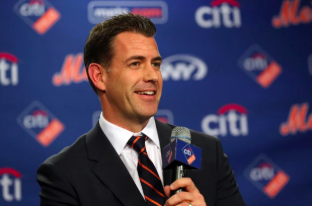 Brodie Van Wagenen started the offseason with a big trade, although it was questioned by some Mets fans. The Mets sent prospects Jarred Kelenic and Justin Dunn along with Jay Bruce and Anthony Swarzak to the Mariners for Robinson Cano and Edwin Diaz. Cano and Diaz both vastly improve the roster in 2019 but many Mets fans believe the Mets gave up too much in the deal. The Mets probably could have gotten the Mariners to take a lot more of Cano’s contract or left out Dunn entirely. Although this probably an overpay, it does vastly improve the 2019 roster and sets up the winning culture in New York. A familiar (Not a pun) face in New York, Jeurys Familia signed with the Mets on a 3/30 deal after spending a few months in Oakland. Familia was one of the younger relief pitchers on the market and while he is known for his failures in the postseason (he really only blew the 16’ wildcard game), he has been a good pitcher over the past few years. He did have a mediocre 2017 but every other year has been good or great. This is a great deal for the Mets because they got a guy who has proven that he can pitch effectively in New York for a moderate price. Brodie Van Wagenen measured the catchers market perfectly. He wanted J.T. Realmuto but he couldn’t trade Brandon Nimmo, Amed Rosario or Michael Conforto. He then turned to the second best option and offered Yasmani Grandal a 4 year, 60 million dollar contract which Grandal rejected. Then he turned to Ramos, who accepted a 2/19 million dollar contract, which is an absolute bargain. Ramos, when healthy, is a great offensive catcher and an overall good player. He can really help the Mets and improve their team going forward. Both of these deals are depth deals. Broxton will be a semi-regular, getting playing time when Conforto, Nimmo or McNeil isn’t playing the outfield. When Yoenis Cespedes comes back, Broxton will help ease him back into the starting role and possibly become a pinch-hitter/defensive replacement. J.D. Davis will either be a bench player or stay in AAA. He has the potential to be a good player but hasn’t panned out so far. He clearly has talent, as shown by his minor league numbers, but hasn’t yet put it together in the Major Leagues. He should get a chance with the Mets at some point in the year and will have the opportunity to prove himself. A good depth move for the Mets. Avilan should make the Opening Day roster and is a reliable reliever. While he isn’t necessarily amazing, he should provide a stable arm in the Mets bullpen. Considering the Mets lack of left-handed relievers (although it was lessened by Justin Wilson), the Mets could use another option for their bullpen. Another great move for the Mets. Jed Lowrie has turned a corner the last 2 years and has been really good. Although he is going into his 35th season, he is a great signing for the Mets at 2 years, 20 million. He greatly improves their infield and makes their bench a lot better. Although Lowrie pushes Jeff McNeil to the bench, McNeil will get a lot of at-bats. He’ll play everywhere and greatly improve the depth of the team. The Mets most recent deal, the Mets signed Justin Wilson to a 2 year, 10 million dollar contract. This deal is an overall good signing for the Mets because they needed a lefty in the bullpen. With only Daniel Zamora and Luis Avilan as their possible opening day left-handed relievers, the Mets needed someone who could be relied on. While both of the guys mentioned have talent, they’re not top-notch stars. Wilson provides strikeout numbers and can be the left-handed reliever that the Mets lacked in 2018. This offseason has been a great one for the Mets. They vastly improved in almost every single area of need and they should be a lot better in 2019. While maybe not a guaranteed World Series contender, they should have a chance to win the division and go the distance.